Profigold PROL1201 High Definition slim HDMI High Speed with Ethernet cable ideal for installing Blu-Ray to LCD or LED screen etc. 24k Hard Gold plated contacts, for excellent protection against corrosion. Die cast metal alloyed rotatable connectors with polished chrome shielding to ensure long lasting connectivity without signal influence or loss. Superior flexible outer cable jacket, avoids cable twisting and cable fracture. HDMI High speed with Ethernet standard. Silver Plated 99,9996% Oxygen Free Copper conductors, for high speed full HD signal transmission. High Quality PPE insulation, to ensure crystal clear sound and vision. Multiple shielding, for maximum protection from RF. Nitrogen gas injected FPE dielectric.Nitrogen gas injected FPE dielectric. Supports 10.2GBPS / 1080P / 720P / 1080I / Deep Colour High definition video, multichannel audio. Is this an HDMI 1.4 Cable? 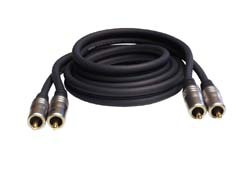 New HDMI Cables no longer have version numbers, this is a High Speed with Ethernet HDMI Cable, it supports all current HDMI functions including ethernet, audio return channel and x.v.Colour.